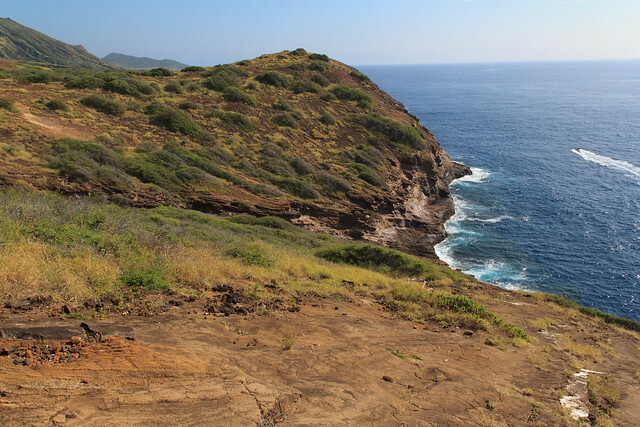 There is a road that starts just at the entrance to the Hanauma Bay Nature Preserve and heads up to the top of Koko Head. 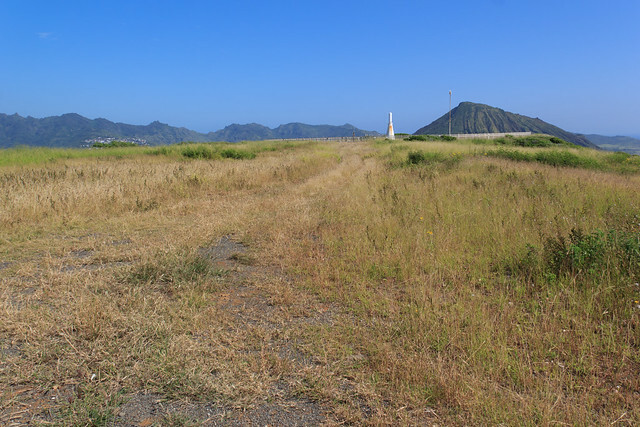 We started at the parking lot for the Koko Head Crater park, where you usually park to head up the tracks for Koko Head Crater. From the park we walked up a road toward Hanauma Bay and veered right up just past the bus stop and up past a locked gate toward Koko Head. The road is short, only about one and a half miles to get to the top. Up at the top are some cell towers and radio towers. 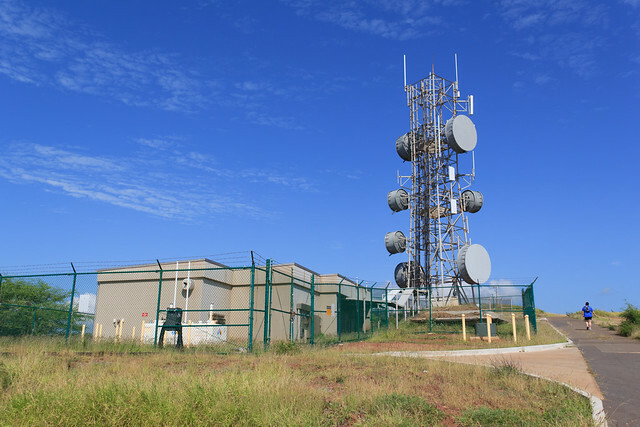 At the top of the hill is an FAA radio beacon/transmitter. The whole thing was fenced off with clear warnings not to trespass. 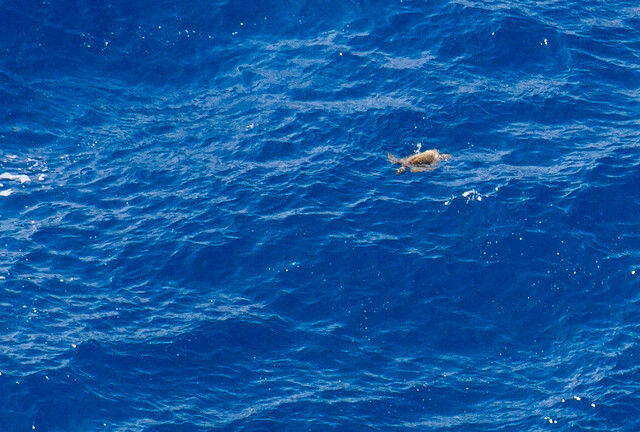 At the middle was a large white transmitter/beacon, about 15 feet tall. 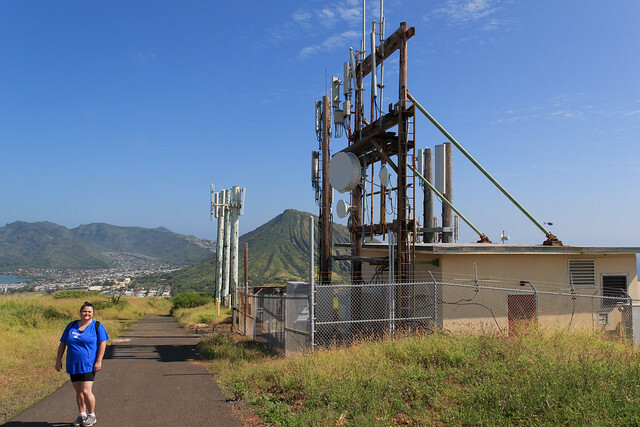 I really wanted to trek down and around the far end of Koko Head where there is a little loop that edges around a couple of crates hidden from view from the main road. In one of the craters is a very rare fern/clover, the Ihi‘ihilauakea, that grows only on a couple of places on O`ahu and Moloka`i. The ferns only germinate when they are submerged in water. 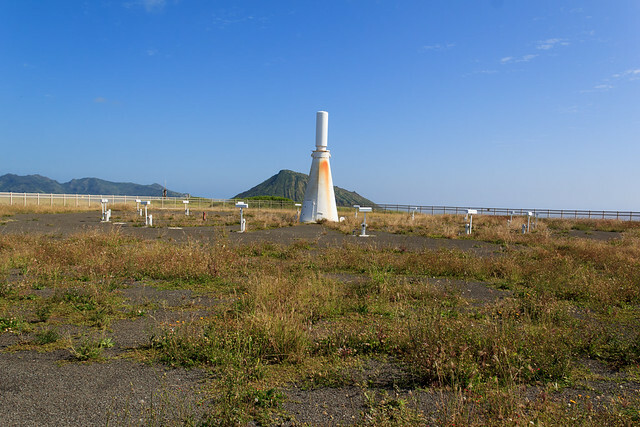 Unfortunately for the ferns the Koko Head pond only fills about once every six of seven years! 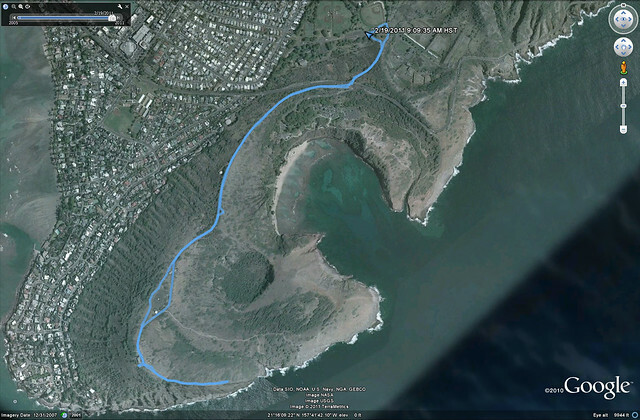 Anyway, I wanted to hike down around the craters at the far end of Hanauma Bay. 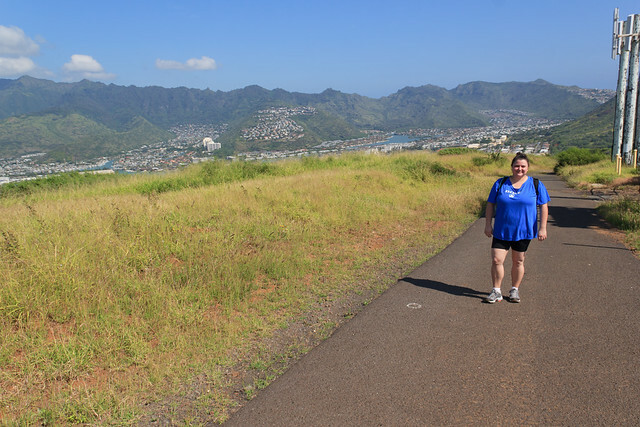 Sommer didn't want to come, but after some prodding she reluctantly agreed to come down along the trail at the end of the road on top of Koko Head. Unfortunately I led Sommer down the wrong trail that ended up one ridge over from where I wanted to go...and there was no way to cross over to the right ridge. So, that trek will have to wait for another day. Looking over the edge of the cliffs leading down to the ocean I saw a turtle! 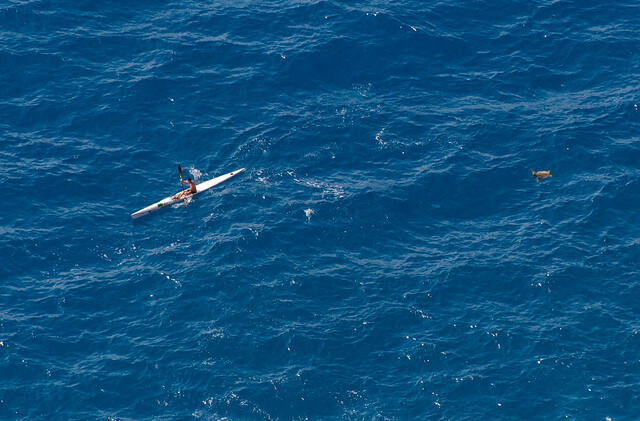 He was even trying to race a kayaker...a modern day tortoise and the hare! 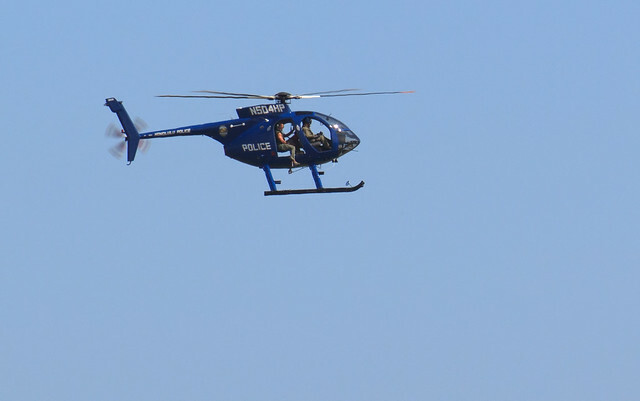 The whole time several helicopters buzzed all around and over head, including this police helicopter. 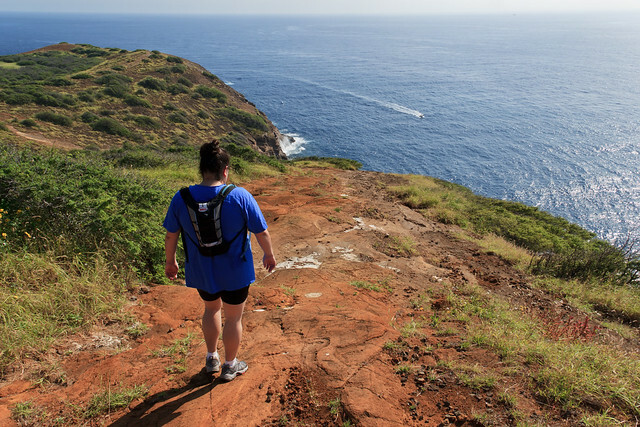 From up on top of Koko Head there are some great views of Hawaii Kai and Kohala, Hanauma Bay and the Pacific Ocean. 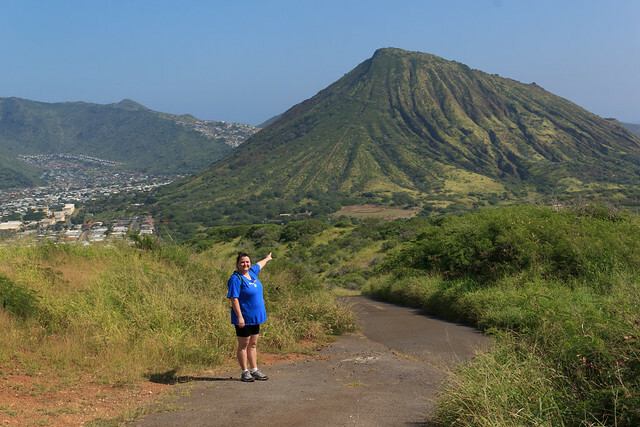 Sommer pointing out the tracks going up Koko Head Crater. Rest of the set here. Has it really been 5 years? 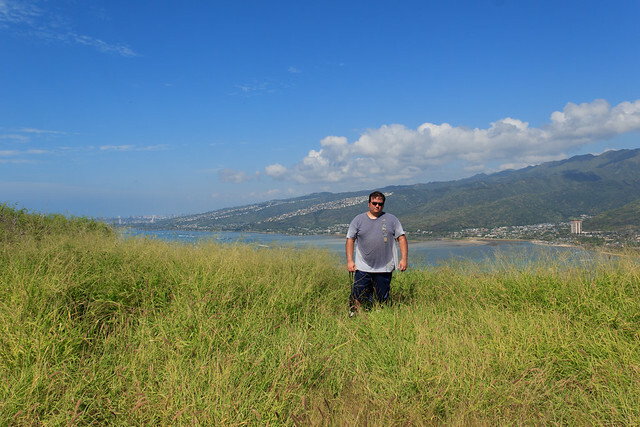 1-15-2018: Kaua'i - Wailua Headwaters "Blue Hole" & "Weeping Wall"
Hiking trails in Hawaii (on Oahu). [--NEW--] I'll call this, the ULTRA sign: An Ultradurable, ultralight, ultracheap, and ultracool trail sign that's easy to make.